Lois Faber has always loved music and melodies. She started piano lessons at age 5, added violin and guitar at age 8 & 9. Her violin teacher was a classically trained preacher who loved to improvise on simple hymns turning them into works of art. She was influenced by classical, folk, sacred music as she “jammed’ with teachers and friends. Lois chose to major in music and received her degree from the University of Utah. While active in her church and raising seven children, Lois began writing congregational worship songs, children’s songs, arrangements for choirs, and songs for solo singers. Many of the songs have become regular repertoire in the local congregation. Currently she is the school music director at EskDale High School. Although the school is located in a small, rural setting, it is well-known for its emphasis and excellence in music. Mrs. Faber teaches Orchestra, Choir, beginning Band and Strings, Guitar, AP Music Theory, Theatre, as well as private lessons. Lois believes every student has the potential to rise to excellence. Students respond and her performing groups and soloists have gained respect for excellent performances in region and state music events. Several students have received vocal and instrumental scholarships at Universities throughout the state. 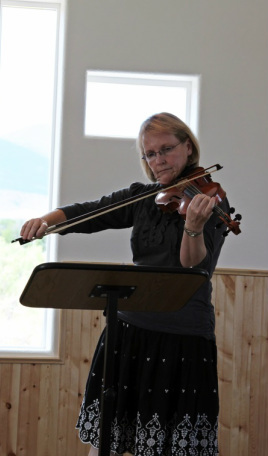 Lois has served on the Utah Arts Council, received the American String Teachers Association Secondary Teacher of the year in 2006, and conducted the 2011 Utah Honors Choir at Abravanel Concert Hall in Salt Lake City.